Please join us at our 111th Annual Meeting and Dinner with guest speaker Martha Minow, the 300th Anniversary University Professor at Harvard, on April 3 at the Back Bay Clubhouse. On April 19 we’re hosting a traditional Passover Seder Dinner and on April 21, we are celebrating Easter with a Sunday Brunch in Harvard Hall. At the Downtown Clubhouse, back by popular demand, we’ll have $1 Oyster Nights now through May, Monday through Wednesday. Also at the Downtown Clubhouse, don’t forget to join us for Friday Lunch Buffet on April 5. We look forward to seeing you at the Club. We have a few special celebrations happening at the Club this month. On March 2, in honor of Dr. Seuss’s birthday, we’ll screen Horton Hears a Who! on the big screen in Harvard Hall. All ages are welcome. On March 16, we’re hosting a St. Patrick’s Day celebration with dinner specials and a live performance by Irish Step Dancers in Veritas. At our Travel Film and Global Dining event on March 25, we’ll view The Soul of India while dining on cuisine indigenous to the region, served buffet style. We look forward to seeing you at the Club. It’s a new year and we have some wonderful member events planned for you. On January 12, don’t miss Family Movie Night when we’ll show the movie Frozen. On January 17, also at the Back Bay Clubhouse, come to our Harvard Sustainability Discussion: Optimizing for Health in Building. At the Downtown Clubhouse, join us for Trivia Night on January 16 and Friday Lunch Buffet on February 1.We look forward to seeing you at the Club. If you are like us, you can’t believe December starts this weekend. On December 4, don’t miss our EndZone Luncheon with former Patriots player Troy Brown at the Downtown Clubhouse or our Friday Lunch Buffet on December 7. Our New Year’s Eve Celebration, also at the Downtown Clubhouse, is filling up quickly so we recommend you make your reservations today. At the Back Bay Clubhouse, we’ll host our Annual Children’s Brunch with Santa on December 8 and a Victorian Christmas Dinner on December 13. Everyone gets busier around the holidays so take a moment to register now for upcoming Club events. At the Downtown Clubhouse, don’t miss our EndZone Luncheon Series on November 5 with former NFL player Troy Brown. At the Back Bay Clubhouse, we’re having an Indoor Tailgate Brunch before The Game on November 17. Also at the Back Bay Clubhouse, we’re hosting our annual Thanksgiving Buffet on November 22. Don’t miss the social event of the season – our black tie Member Appreciation Gala on October 27 at the Back Bay Clubhouse. On October 14, get a family heirloom appraised by Skinner at our What’s It Worth event. Join us for the Signorello Estate Wine Dinner on October 16 at the Downtown Clubhouse. Help welcome new members by becoming a Harvard Club Ambassador – learn more at our kickoff event on October 11 at the Back Bay Clubhouse. Introduce your kids to squash at our Open House Junior Clinic on September 8 at the Back Bay Clubhouse. On September 17, join us for Cocktail 374 / Fall Event Preview and hear firsthand about the exciting events planned in the coming months. On September 23, we’re hosting a traditional Harvest Fair in Harvard Hall with activities for adults and kids including games, craft beers, festive cocktails and seasonal tastes. We now have tickets to several Bruins home games so check out page 15 to purchase yours. Vacation time is upon us, but don’t forget to register for upcoming Club events. At the Back Bay Clubhouse on July 9, don’t miss our family friendly Cocktail 374 Red Sox Edition where Wally the Green Monster will make an appearance. Also at the Back Bay Clubhouse, we are once again hosting Battle of the Chefs when chefs from both clubhouses will compete for best dish. At the Downtown Clubhouse, come to our Roofdeck Flamingle, our annual summer party on the 9th floor roof deck on August 8. On August 15, we’ll have a Sunset Yoga with Equinox. Enter our Travel. Share. Win. photo contest by submitting a picture from one of your summer adventures. Make June the month to treat yourself at the Club. At the Downtown Clubhouse, start with Friday Lunch Buffet on June 1, and register for our Mid-Week Manicure event on June 14. At the Back Bay Clubhouse, don’t miss Cocktail 374 on June 11 and our Conservation Discussion: Snow Leopards event on June 19. If you want to attend The Game at Fenway Park on November 17, we have limited tickets available now for purchase on the member website. Please join us at our 110th Annual Meeting and Dinner, with guest speaker George Q. Daley AB’82, MD’91, PhD, Dean of Harvard Medical School, on May 10 at the Back Bay Clubhouse; see page 4 to register. Also, we’re celebrating Mother’s Day with a Sunday Brunch on May 13 in Harvard Hall. At the Downtown Clubhouse, we are hosting a sushi making class on May 9 and on May 1, don’t miss our special post-NFL Draft EndZone Lunch with former Patriot Troy Brown. We look forward to seeing you at the Club. Don’t miss a nostalgic Family Movie Night with Mary Poppins on April 7, and if you’re feeling lucky, join us for Casino Night on April 14, both held at the Back Bay Clubhouse. At the Downtown Clubhouse, our popular Friday Lunch Buffet will be served on April 6, and you can unleash your inner artist at Paint Nite on April 23. We look forward to seeing you at the Club. 2018 is off to a great start at the Club. We begin the month with a family event on Saturday, March 3, celebrating Dr. Seuss’s birthday with a breakfast brunch and entertainment. On March 13, learn how to make St. Patrick’s Day themed cocktails at Mixology. Join us for an 80s themed Murder Mystery Party on March 7 and our popular Trivia Night on March 21. Both Clubhouses are participating in the citywide dining event Dine Out Boston, see page 15 for all the details. We look forward to seeing you at the Club. It’s a new year, and there is a lot going on at the Club in January and February. “Thurgood” comes to Harvard Hall on January 24 and we’re hosting a Norman Rockwell Four Freedoms Discussion event on January 11 as well as a Harpoon Beer Dinner on February 28 at the Back Bay Clubhouse. At the Downtown Clubhouse, former NFL player Troy Brown will join us for an EndZone Luncheon on January 16 and on January 23, we’ll host a whisky dinner honor of poet Robert Burns. Sign up early before these events are sold out. We look forward to seeing you at the Club. The holidays are an exciting and busy, time at the Club. Our festive events include the annual Children’s Brunch with Santa on December 9 and Decorate Your Own Gingerbread House on December 20 at the Back Bay Clubhouse. We also have tickets to The Nutcracker at the Boston Opera House on December 15 and don’t miss our Motown-themed New Year’s Eve bash at the Downtown Clubhouse. We look forward to seeing you at the Club. Don’t miss one of our biggest events of the year – our Member Appreciation Gala on November 4. It’s not too late to sign up! And if you’re looking for some family fun, join us for Family Board Game night on November 18 at the Back Bay Clubhouse. Also at the Back Bay Clubhouse, join us on November 9 for Powerful First Impressions with Doreen Dove, where you will assess your professional image. At the Downtown Clubhouse, we have great tickets for the Bruins vs. Tampa Bay Lightning at TD Garden on November 29. We are full swing into one of our busiest seasons at the Club. 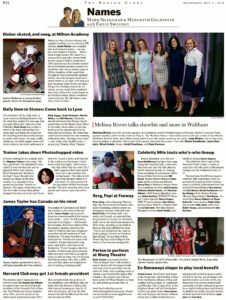 Some notable events at the Back Bay Clubhouse this month include HUBweek Comes to the Club on October 10 and An Evening with Dr. Paul Farmer of Partners in Health on October 23. At the Downtown Clubhouse we are once again hosting Ladies Lounge on October 13 and the Women of the Harvard Club Open House on October 18. Be sure to check out our Travel. Share. Win photo contest on pages 11 and 12. We look forward to seeing you at the Club. Don’t miss new events coming in September. We are launching our monthly party, Cocktail 374 on September 11 at the Back Bay Clubhouse. All members and their guests are welcome. Also at the Back Bay Clubhouse, bring your four legged friends to Yappy Hour on September 14 where you’ll get to mingle with fellow dog lovers. At the Downtown Clubhouse we’re hosting Sunset Yoga with Equinox on September 12 and a Fall Cider Dinner on September 18. We look forward to seeing you at the Club. Boston Magazine© has named Harvard Hall as the Best Ballroom Venue in 2017. Harvard Hall has been the stage for weddings and special events for over 100 years, hosting as many as 350 guests, as well as more exclusive occasions with as few as 50 guests in attendance. “We are honored to be recognized by Boston Magazine©. Harvard Hall isn’t just an event venue, it is the Club’s most iconic and historically significant room. Harvard Hall sets the tone to create memories for a lifetime,” said General Manager, Steven Cummings. We invite you to consider Harvard Hall when planning your next special event. Whether a business meeting, corporate event or celebration, our catering and culinary teams can help you plan every detail. We’ve hosted a century’s worth of Boston’s finest events and look forward to welcoming yours. To get started, click here to view our Weddings and Private Events page. We have exciting new events planned for July and August. At the Back Bay Clubhouse in July, we’ll host a Taste of Summer dinner and at our family movie night we’ll show the classic Run for Your Life Charlie Brown. In August, take part as judges in our Battle of the Chefs competition between our culinary and beverage teams. At the Downtown Clubhouse in July, we’ll have two $1 Oyster Nights and a Children’s Storytime reading with author Suzanne Bloom. In August, don’t miss Dinner en Blanc, our summer party on the 9th floor roof deck as well as a Paint Your Own Tote Bag Night. We look forward to seeing you at the Club. This Thursday, June 8 at 6 pm, join us to celebrate summer and support the neighborhood charity Women’s Lunch Place. You’ll learn how to create beautiful and easy to care for arrangements featuring Fine Garden Designer Ellen Abdow from Perennial Gardens. The workshop will take place at the Women’s Lunch Place, 67 Newbury Street. To reserve your spot, the suggested donation is $10. Please RSVP today to events@womenslunchplace.org. Register early before space runs out for some exciting events this month. On June 7, our Harvard with a Heart panel will host a discussion on the importance of resilience, followed by a group community service project to benefit Y2Y Harvard Square, a student-run shelter. Our 2017 Member-Guest Golf Tournament takes place on June 29 at the Blue Hill Country Club. We’ll host a Spanish Wine Dinner on June 8 at the Downtown Clubhouse and a Rose All Day Wine Workshop on June 26 at the Back Bay Clubhouse. Our family events this month include a Father’s Day Brunch on June 18 and a breakfast buffet with Thomas the Tank Engine and Friends on June 24 at the Back Bay Clubhouse. We look forward to seeing you at the Club. May is busy with family celebrations, family fun and wellness events. At the Back Bay Clubhouse, on May 2, the Women of the Harvard Club Leadership Committee presents the 5th Anniversary Boston’s Most Influential Women Celebration. Join us for Mother’s Day with a brunch buffet on May 14. On May 19, come to family movie night featuring “Sing” the hit film. On May 25, we’ll celebrate Harvard Commencement with a dinner in Harvard Hall. At the Downtown Clubhouse, we’ll host a floral arranging workshop on May 10 and a Seafood Story Dinner with Foley Fish Company on May 17. On May 18, join us for our Develop Your “Whole U” wellness workshop. We look forward to seeing you at the Club. April is a busy month with many events in keeping with the season. At the Back Bay Clubhouse, join us on April 13 as we exhibit art from our archives that has not been seen for decades, if ever and for Easter Brunch on April 16. At the Downtown Clubhouse, our Friday Lunch Buffet is on April 7 and we have a floral arranging workshop on May 10, just in time for Mother’s Day. We encourage all members to come cheer on participants in our Annual Squash Championships on April 15. We look forward to seeing you at the Club. Due to the snow storm hitting Boston on Thursday, February 9, the following hours for both Clubhouses will be in effect. Downtown Clubhouse: Breakfast and lunch in The Crimson, closed for dinner service. Back Bay Clubhouse: Breakfast and lunch will be served in Veritas until 4 pm, dinner will be served in ClubPub. Administrative Offices: Open 9:00 am to 3:00 pm with limited staff. Athletics Department: Open 5:00 am to 1:00 pm, locker rooms close at 1:30 pm. Should there be any changes in Club operations, we will promptly notify you. Join us for a romantic Valentine’s Day dinner or a family event that includes an exclusive brunch with Mickey & Minnie before a live performance of Disney On Ice at TD Garden. If you consider yourself a trivia aficionado, come to Trivia Night at either Clubhouse. Be sure to register for The Ricky Kalmon Hypnosis Show soon, as we anticipate it will sell out quickly. We look forward to seeing you at the Club. Harvard Club of Boston President Karen Van Winkle ’80 was recently interviewed on Women to Watch,™ a live weekly radio show and digital platform that tells the real story behind the titles of some of the most accomplished women worldwide. Click here to listen to the interview. Make a New Year’s Resolution to come to the Club for our exciting January 2017 dining and member events. At the Downtown Clubhouse you can attend a Create Change by Managing Stress Workshop or our Faculty Lecture Series with Professor Jessica Stern. At the Back Bay Clubhouse, join us for a Kids Cooking Class or a Puccini Opera Screening. And, we’re kicking off Trivia Night at both Clubhouses. We look forward to seeing you at the Club. The holiday season is a festive time at the Club. Our upcoming events include the annual Children’s Lunch with Santa, our Member Holiday Open House with the Copley Singers performing live and a New Year’s Day Brunch in Harvard Hall at the Back Bay Clubhouse. We’ll host a unique tasting event with Taza Chocolate and close out 2016 with an old Hollywood themed New Year’s Eve Bash at the Downtown Clubhouse. This month join us for Election Night in the ClubPub and watch the numbers come in while enjoying party themed drinks and apps. We have several events for foodies including an Italian Wine Dinner at the Downtown Clubhouse and a Port Wine Tasting at the Back Bay Clubhouse. Families, join us for a viewing of the original Willy Wonka movie in Harvard Hall. And don’t miss our Four-Handed Illusions magic and comedy performance at the Back Bay Clubhouse, a fun night out for adults. November is National Pet Awareness Month, so be sure to check out the photo collection of members’ rescue pets on page 9. Fall has arrived and our event calendar reflects the new season. Join us for our complimentary Fall Preview Event on the 3rd and get a sneak peek of upcoming activities, including a sampling of our new dinner menus. On the 14th come to our Fall Festival and enjoy seasonal brews, hard ciders, food and live music. On the 6th join us for a unique Olive Oil Tasting event. And, on the 19th please join us for the Women of the Harvard Club Fall Open House. We have some unique events scheduled in September. Our Journey to the Boston Light is on the 9th and our Member-Guest Golf Tournament at The Golf Club of Cape Cod on the 15th. Join us at the Back Bay Clubhouse for Sunset Yoga with Equinox on the Equinox, an evening of Estate Jewelry & Cocktails and our LetGo Your Mind, family LEGO event. At the Downtown Clubhouse join us for two special dining events – a cider tasting and an olive oil tasting. And, be sure to check out the winner of our Travel. Share. Win. photo contest, along with our honorable mentions. When making your plans this summer, be sure to check out the events taking place at the Club over the next two months. Our Journey to the Boston Light exclusive boat tour is on July 22. We have tickets to see James Taylor at Fenway on August 3. At the Downtown Clubhouse, join us for our Sunset & Sangria Social on July 28 and this year’s summer roof deck party, Havana Nights at the Harvard Club, is on August 10. We have many dining events at the Back Bay Clubhouse ClubPub and Veritas, including two $1 oyster nights when our Chefs will be shucking fresh oysters on site. We are pleased to announce we have a new Chef at the Downtown Clubhouse, Executive Chef Jason Banusiewicz. Chef Banusiewicz has been with the Harvard Club of Boston since September 2014 working at the Back Bay Clubhouse, and joined the Downtown Clubhouse in June. A Massachusetts native, Jason is a 2004 graduate of the Culinary Institute of America (CIA) in Hyde Park, NY. After graduation, he began his career as an intern at the Top of the Hub in Boston, MA, and a decade later, oversaw the Top of the Hub kitchen as Chef de Cuisine. During his ten years there, Jason participated in the 2008 Boston Gluten-Free Cooking Spree and received the award for Best Gluten Free Dish. Jason prepared dinners at the venerable 2009 James Beard House, and also finished as a finalist in the Unsung Hero category with the Massachusetts Restaurant Association (MRA). 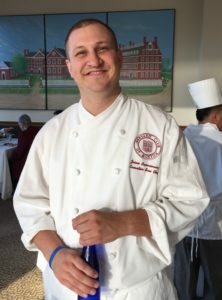 He enjoys sharing his talent while giving back to his community and was a participant in The Taste of the Back Bay, Chef in Shorts, the Spinazzola Fund and Pro Start events with the MRA. 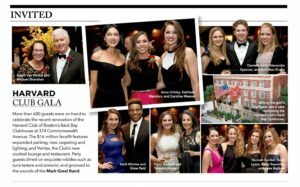 All the fabulous changes at the Harvard Club recently have attracted the attention of some of Boston’s most influential news outlets. Following is a summary of some recent publicity that has appeared about the Club and its new President, Karen Van Winkle. Welcome back to Boston, Jeff Immelt! 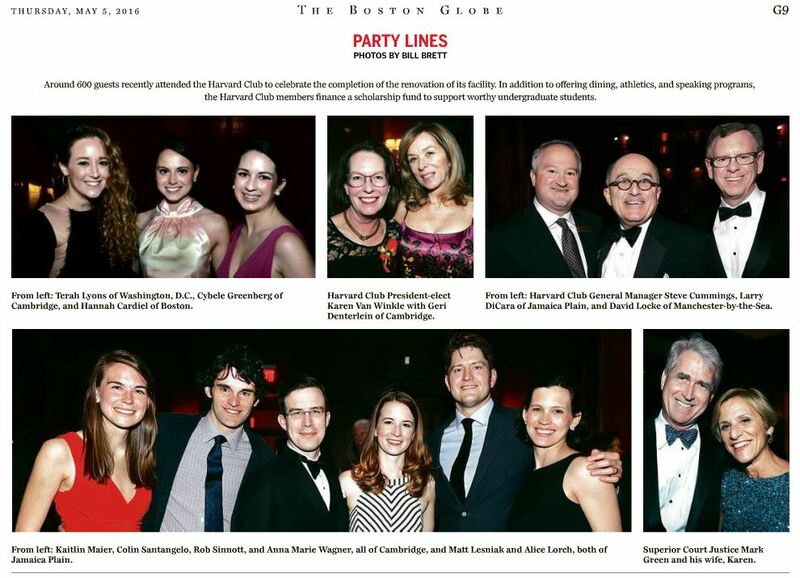 And here are some recent photos of the Harvard Club in the news. Summer is here and we have a lot going on at both Clubhouses. Don’t miss our complimentary Member Benefits Bash and learn more about your member perks. Join us for our Author Series with fellow Club member Greg Stone. Our family event this month is an interactive workshop “Up, Up & Away” where kids will explore the principles of air pressure. Learn about launching a global social media app at “Tales from the Trenches” with fellow Club member Max Meyer. And be sure to celebrate Father’s Day with us in Veritas. Boston, MA (May 25, 2016) – After 108 years, the Harvard Club of Boston has welcomed its first female President, Karen Van Winkle, a Harvard College alumna and native of Cambridge, Massachusetts. Ms. Van Winkle’s election at the Harvard Club of Boston’s Annual Meeting on May 23, 2016, for a three year term, heralds a new era for the organization as it seeks to grow and diversify its membership and enhance its presence in Greater Boston. which included a new rear entrance, new private dining room, new elevator, a refurbished athletic center, with five squash courts that cater to players ranging from ages 5 to 85, as well as the addition of ClubPub, a casual dining venue and Veritas, the Club’s cocktail lounge and restaurant. president Mike Shanahan for his service to the Board and his ongoing support,” said Ms. Van Winkle. Pavilion, a Boston-based leading provider of workplace solutions and Herman Miller furniture dealer. Creative Office Pavilion’s healthcare and lab sales professionals. Denise Horn, Principal and President of the Creative Office Pavilion cited Ms. Van Winkle’s leadership skills. 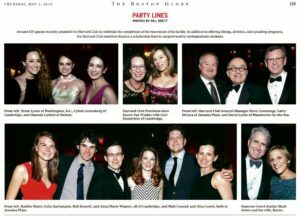 “The Creative Office Pavilion team could not be happier for Karen in her new role as President of the Harvard Club of Boston. She possesses ambition, drive and tenacity, which have contributed to our company’s success. In turn, the Harvard Club will benefit immensely from Karen’s ability to lead and motivate others to achieve Club goals,” said Ms. Horn. The Harvard Club of Boston is a private club established in 1908 to encourage the social, intellectual and athletic interests of our members, to promote the welfare of Harvard University, to assist students with financial aid, and to foster the Harvard Spirit in all Harvard men and women. The organization maintains two clubhouses: one in the Back Bay neighborhood in Boston, and one in the Financial District. Members of the Club have access to exclusive events, dining opportunities, and athletic facilities in the two locations. With approximately 5,000 members, the Harvard Club is one of the City’s premier private clubs and has been named a Platinum Club of America. As a Harvard Club of Boston member you, are invited to enjoy a complimentary ‘Member for a Day’ experience at Blue Hill Country Club. Your day may include: a complimentary round of golf, relaxing by the outdoor pool, grabbing a bite to eat on the outdoor patio/terrace, or dinner in the club’s formal dining room. Located just outside of Boston in Canton, MA, Blue Hill Country Club is considered to be one of New England’s most cherished private golf courses for almost a century. Home of the 1956 PGA and the home course of the LPGA Tour from 1991-1997, Blue Hill offers 27 holes for players of all levels as well as various practice areas. If you decide that membership at Blue Hill Country Club is for you, Harvard Club of Boston members will receive a discount on their membership equal to their annual Harvard Club dues. And you won’t be put on a waiting list for golf. So you’ll be able to enjoy both Clubs for the cost of only your Blue Hill Country Club membership fee. Initiation fees apply. To book your complimentary ‘Member for a Day’ experience, please contact Aimee Burke, Membership Director at Blue Hill Country Club, email: aburke@bluehillcc.com, phone: 781-828-2000 x 202. Tee times are based on availability, first come, first served. Additional guests (including non-members of Harvard Club) are welcome with additional golf guest fees. We have many noteworthy events at the Club this May. The Women of the Harvard Club Leadership Committee invite you to the Boston’s Most Influential Women Honoree Reunion Reception. Our Mother’s Day Buffet will take place in Harvard Hall again this year. The Downtown Clubhouse is hosting a Honey Tasting on the 18th. Both Clubhouses will have special Commencement dining events. And on the 23rd our Annual Meeting and Dinner will take place at the Back Bay Clubhouse. All Harvard families are invited to participate in the Harvard Club of Boston’s Commencement Buffet. Celebrate the milestone by enjoying a spectacular meal in the unmatched ambience of Harvard Hall. Prices per person: Adults $48.50 (plus Club charge* & tax), Children 3-12 years old $27.50 (plus Club charge* & tax), Children 3 and under: complimentary. Cancellation date: Monday, May 23, 2016. To register, please call Jennifer Cleary at 617-450-8493. We have many exciting events happening in April at the Club. Ladies can enjoy the ultimate girls night out at our Ladies Lounge event at the Downtown Clubhouse. MLB’s Opening Day is the 3rd so be sure to get your tickets to upcoming Red Sox games. Our annual Father Daughter Tea Dance will take place at the Back Bay Clubhouse. And please be sure to attend the Member Appreciation Gala taking place on April 30th. March will be a very busy month at the Club. We’ll open the new Veritas Restaurant at the Back Bay Clubhouse. Football fans can join us for Conversations with Coach Timothy L. Murphy, Harvard’s all-time winningest coach. Our family programming will introduce kids to the ooey-gooey world of polymers at our Slippery Science Workshop. Join us for our always popular Easter Brunch Buffet in Harvard Hall. And last, but not least, please check out the details for our Member Appreciation Gala taking place on April 30th. 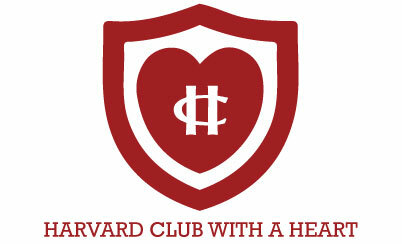 February is the perfect month to visit the Harvard Club. Bring your special someone in for a romantic Valentine’s Day celebration, or attend one of our many member activities. Stop by for a special night at our new Veritas Lounge and have a cocktail and a bite to eat. Learn how two HBS students created a company in their dorm room and then were featured on Shark Tank. Expand your horizons by attending the Author Series with Geoffrey Cowan, the Faculty Lecture Series with Professor Benjamin Friedman, or hear Fionnuala Quinlan, the Consul General of Ireland to Boston. Or just stop by on Pop Up Night and have a cocktail with your fellow members. Click here to download the February Bulletin. Click here to download the January Bulletin. Click here to download the December Bulletin. ANNUAL EVENING OF LIVE BOXING! 7:45 pm Live Boxing Begins in Harvard Hall! On February 25, 2015 the Harvard Club of Boston’s transformation began. Pictured above, from left to right: Anthony Consigli, President of Consigli Construction; Steve Allison, Board Member & House Committee Chairman; Doug Karam, Owners Representative, KVA; Katherine Craven Kryzanski, Board Member & Master Facilities Planning Committee Chair; Bill Felton, Master Facilities Planning Committee Member; Mike Shanahan, Club President; Karen Van Winkle, Club Vice President & Master Facilities Planning Committee Member; Steve Columbia, Master Facilities Planning Committee Member; and Club General Manager Steve Cummings.